The dogs and kitties of lower Fairfield County are polished, pampered and catered to from their pedicured toenails to their beautifully groomed coat-dos. The stylish dog strutting beside his or her master or mistress is an image that goes back to royalty, high class and even politics. Cats were the pets of palaces. The pharaohs of ancient Egypt hunted on horseback, riding the banks of the Nile River with falcons perched on their wrists. Sleek dogs ran alongside, flushing game from bushes. European royalty hunted with Wolfhounds, Elkhounds and Staghounds in their fiefdoms and private game preserves. Retrievers and water spaniels were bred for duck and goose hunters. George Washington established the first foxhunt in this country, importing foxhounds, horses and red foxes from England. The native American gray fox runs in circles and climbs trees, which made hunting on horseback impossible. The English red fox runs in a “line.” Chasing it at a gallop is possible; thus, the popularity of hounds that are great companions to man and horse. Today, as in the past, bloodhounds and other dogs of sharp “nose” are great trackers. The Pekinese, Pomeranian and Chinese Crested toy dogs were the companions of emperors and empresses. Lhasa Apsos guarded Tibetan temples and warned the monks of intruders. Most of these ancient Asian breeds came to the West as gifts to the kings and queens of Europe. They gained favor with European royalty and slowly sifted down to the upper, and then, middle classes. The Siamese cat was a palace guardian. Kept within the walls of be-flowered courtyard gardens, it enjoyed heights and stretched languidly on the limbs of trees. Should a stranger intrude, the cats would emit bloodcurdling yowls, screeches and howls, alerting the guards. The cats would jump on the intruder’s head with all 10 claws bared, growling fiercely. Scary! Mid-19th century England, and quickly, other European countries, prospered in the Industrial Revolution. Class changes saw an increasingly wealthy middle class. Manufacturers and merchants became magnates. The would-be lords and ladies of fashion enhanced their stature through dogs made popular by royalty. They took up hunting and bought retrievers and hounds. They had leisure time and bought toy dogs and poodles. They bought farms and trained dachshunds to go after rats. They took up foxhunting and bought horses. Lords, ladies and “wannabes” had their portraits painted with dogs sitting alongside them or in their laps. Trades and professions built up around pets, including groomers, who bathed, clipped and pedicured, and veterinarians who specialized in large and small animals. Pedigreed cats and dogs became objects of great social interest, including working dogs, sport, companion and toy animals. And so it is today, working, middle and upper-economic and social brackets follow their interests and/or the elite in their choices of cat and/or dog breeds. People who hunt go for hounds, spaniels, pointers and/or retrievers. And so on through the rallies, the shows and the fun family pets in most backyards. 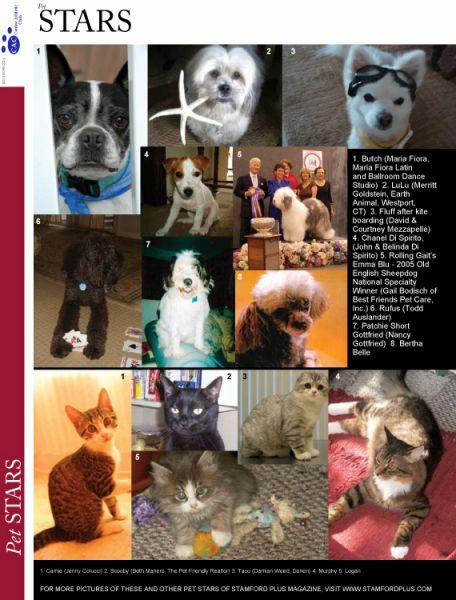 Many of the wealthiest people on the Fairfield County “Gold Coast” choose “rescue” dogs, obtaining lovely purebred animals from breed-specific rescue societies. The truly idealistic adopt mixed breeds from pounds or shelters which they sponsor and patronize with glittering charity benefits. The most popular breeds in this year’s Greenwich Kennel Club, American Kennel Club (AKC) recognized show, held in at Taylor Farm Park in Norwalk, were the Vizsla (Hungarian Pointer), with 96 dogs entered, and Portuguese Water Dogs, with 71 entrants. However, Best-in-Show was a gentle family dog, a Newfoundland. “The family dog breeds are the most popular, and we sell tons of food to people with kids and dogs. A family dog may be a show dog or a mixed breed. 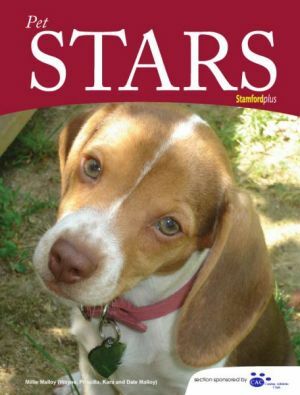 People care a lot about their animals,” said Gil Beck, whose Stamford company Sportin’ Life distributes and sells at retail upscale pet supplies and brands of cat and dog food. Beck, a true dog person, has judged AKC-recognized shows. He’s bred Irish Wolfhounds and now owns two Doberman Pincers that “cost as much, each, as a good car,” plus a sweet mutt. “People aren’t looking for bargains when it comes to their animal’s health. They’d rather pay for healthy products than veterinary bills,” said Beck. On the other hand, puppy-mill animals, with papers, are sold for top prices in some pet shops. These are not only expensive but often, ill-bred, malnourished, ill formed and sickly. Anyone can reach a breed-specific rescue society via the American Kennel Club website and get a dog that someone has had to give up for any number of reasons. People in Fairfield County are devoted to their friends, even more so—to their best friends. That’s why there is a myriad of services for dogs in our area that cater to an increasinlgy diverse mix of breeds and owners. For any breed of dog or mutt, training is essential. The AKC has a program called the Canine Good Citizen that helps dogs to understand their jobs and owners to understand their dogs. Training throughout the industry is by positive reinforcement—no yelling, hitting or other practices that may hurt the dogs physically or psychologically. It used to be that the stay-at-home mom would care for the family dogs and cats. Today, even stay-at-home moms are too busy with their children’s activities to give the attention that family pets deserve. In an era of nannies for children, Kristin is very much of a nanny to the pets in her care. Understanding the needs of dogs and some cats is her business and she takes pride of her work. She also teaches pet owners how to take care of their animals when they are at home with them. The fact that she comes to the home to walk the dog, give it a little “mind-your-manners” training and affection is stabilizing to young or more sensitive animals. Kristin herself or one of her team members would come to a client’s door to care for your pet as many times as necessary during the day and would provide sleep-over services if necessary. 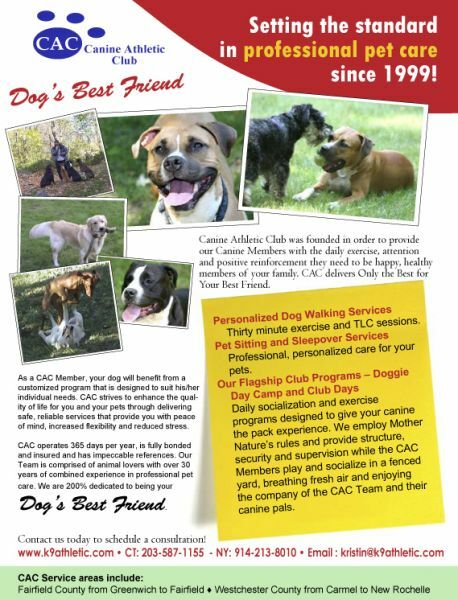 She also has a fenced yard where members of CAC can socialize with other canines out in the open while getting the structured training that they need to keep their body and mind healthy. Kristin Leggio’s warmth and enthusiasm gives pet owners peace of mind that their best friend is getting the attention and care they deserve. Grooming is extremely important to a pet’s comfort and health, especially if it is a long-haired dog or cat. Fleas, ticks, mats, tangles and dirt need to be removed by bathing, clipping and brushing. Toenails must be clipped carefully. Gentle handling from kitten or puppy-hood helps the young animal accept this necessary part of life. It’s wise to prevent the fear response of whining, crying, biting and squirming that can make grooming extremely difficult. “Housebreaking and the discouraging of mouthing and chewing inappropriate items (like your shoes) should start at six weeks. The dog should learn the hierarchy of the household so that the owner becomes its alpha wolf, the leader that the animal listens to and tries to please,” says Onthank. Best Friends Pet Care grooming salon is regulated by high standards. Groomers (stylists) are trained and well equipped. Fees depend on the size, coat type and condition. “We can provide grooming for show on request, but most people just want their animals bathed, coat and toenails clipped.” They also give medicated baths, skin conditioners and dips for fleas and ticks. Being a good corporate citizen, Best Friends Pet Care puts on benefits, raising money to equip fire departments with oxygen masks for pets. They’ve provided 2,800 masks to 500 fire departments. Veterinarians are historically essential to animal health. General-practice veterinarians, veterinary surgeons and eye specialists are doing very, very well. Any caring prospective dog/cat owner will ask the breeder, a dog-owning friends, pound manager, or shelter director for the name of a good vet. Dr. Martin Goldstein, owner of the Smithridge Animal Hospital, in Vista, NY, provides alternative medical care to dogs and cats. The post-operative or injured dog or cat needs physical therapy, including massage/touch, palpating and working the area, in-water treadmills, swimming, and specialized fitness programs. Hip replacement, shoulder, back and neck surgeries, neurological issues and broken bones all require therapy. Aside from grooming and veterinary care, dogs need exercise. Many families are too busy to walk their dogs. Double-income families need help too, with both partners gone every day. The dog walking business is growing in strides. Dog walkers are busy and virtually all have waiting lists. One of her most curious sessions involved an old dog and a long-married couple. “Suddenly, the dog started leaving the room when the husband was around. The wife worried about this change in behavior. The dog told Ann Marie that being around the man made him terribly sad. The man died three weeks later. The dog picked up on his illness and impending death. He just couldn’t stand it.” She also addresses behavioral problems; animal will describe their discomfort. There are many ways to buy or adopt cats and dogs. On the high end locally, The Greenwich Kennel Club is recognized by the American Kennel Club and its members are local, knowledgeable breeders of fine show dogs. The Greenwich Kennel Club puts on an all-breed dog show every June, in Norwalk, at Taylor Farm Park. With more than 1800 dogs participating at every level in 2007 the club is active, with member/breeders working to improve all breeds. The proceeds from the show go to support The Baker Institute of Animal Health, which is part of Cornell University. They have developed multiple life-saving vaccines and treatments for animals. 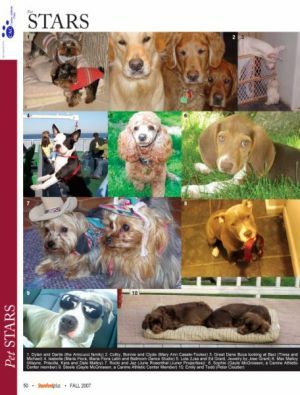 Among the many adoption organizations is the uniquely caring Adopt-A-Dog, headquartered in Greenwich with kennels in Armonk, NY. Executive Director, Michelle Rinaldi and an adoption specialist visit municipal animal control facilities in New York City often taking animals scheduled to be killed. 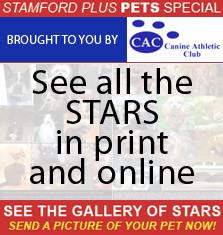 The Stamford Dog Pound is a municipal facility and the only shelter in Stamford. Ms. Laurie Hollywood, animal control officer, says that the two major dog problems in Stamford are barking dogs and roaming dogs. The pound provides free obedience classes from 6:30-7:30 on Wednesday evenings. Adoption is inexpensive. The basic fee is $5 and there is a $45 charge for vaccinations and spay or neuter. Their record is stunning! In 2006, 210 dogs were adopted, 222 cats, 11 rabbits, one lizard, two birds, one hamster, four ferrets and two chickens. People give many reasons for relinquishing pets, including moving and can’t take the pet with them; a family member developing allergies; financial problems; divorce; and lack of time to care for the pet. Friends of Animals recently celebrated its 50th anniversary at a gala in Manhattan. This organization has spayed and neutered 2.5 million dogs and cats since their inception.